Department of Botany, Surendranath College, Kolkata, West Bengal, INDIA. Phytochemistry and Pharmacognosy Research Laboratory, Department of Botany, University of Calcutta, 35 Ballygunge Circular Road, Kolkata 700019, West Bengal, INDIA. Antioxidants have important role on human health as well as in food industry. Natural antioxidants are preferred to synthetic antioxidants. In this study attempt was made to explore the leaf biomass, generally wasted and burnt, as sources of important antioxidant compounds. Extracts of leaves from five plants e.g. 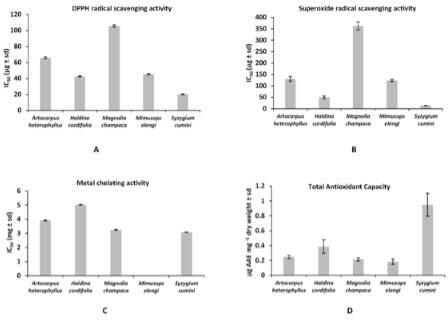 Artocarpus heterophyllus, Haldina cordifolia, Magnolia champaca, Mimusops elengi and Syzygium cumini were analyzed for their antioxidant properties by four different systems of assays. Identification and quantification of important components were performed using GC-MS.
All the extracts scavenged DPPH radical, superoxide radical, and chelated metal. S. cumini showed strongest antioxidant activities in all systems of assays. Many important phenols and other metabolites were identified. Correlation between activity and metabolite profile helped to identify important antioxidant compounds in the extracts. Important phenolic antioxidants identified were catechin, epicatechin, protocatechuic acid (from S. cumini), gallic acid, myricetin (from S. cumini, M. elengi), arbutin, 4-hydroxycinnamic acid (from M. elengi). Thus, the leaf biomass may be used as an alternative source of these important phytochemicals having antioxidant activity. Extracts of biomass waste (leaves) from five plants e.g. 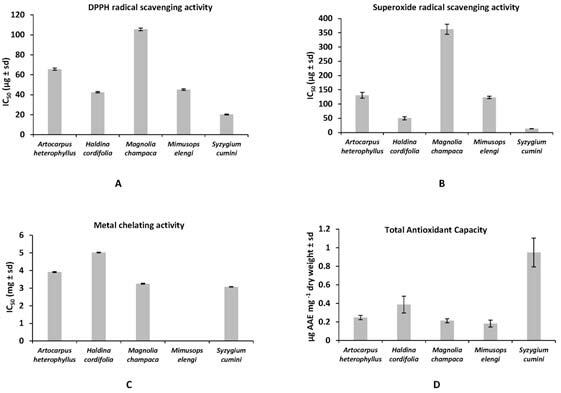 Artocarpus heterophyllus, Haldina cordifolia, Magnolia champaca, Mimusops elengi and Syzygium cumini showed antioxidant activities against free radicals and chelated metals. The extracts were found to be sources of important phenolic phytochemicals e.g. catechin, epicatechin, protocatechuic acid (from S. cumini), gallic acid, myricetin (from S. cumini, M. elengi), arbutin, 4-hydroxycinnamic acid (from M. elengi) having antioxidant activities. Plants having large foliar canopies like trees produce enormous leaf biomass with negligible uses like fodder and for soil amelioration, serve no commercial use and are generally burnt. This huge raw mass is only the cheapest and cost-effective route from photons to fuels 6 and pharmaceuticals. But the biomass is getting lost without proper evaluation. So, the underutilised renewable stream may be a promising alternative source of bioactive chemicals and pharmaceuticals in sustainable economy approach. This concern leads us conducting the present study where we had chosen some indigenous tree species of India with folklore claims as well as religious significance to the tribal groups. The objectives were to study the antioxidant properties of leaf extracts of such plants and identify the active components. Ferrozine, ferrous chloride, DL-methionine, nitro-blue-tetrazolium (NBT) were purchased from Sisco Research Laboratory Ltd., India; 2, 2 diphenyl-1-picrylhydrazyl (DPPH), N-methyl-N-(trimethylsilyl) trifluoroacetamide (MSTFA), methoxyamine hydrochloride, adonitol and FAME (Fatty Acid Methyl Esters) from Sigma-Aldrich (USA); Folin-ciocalteu, ammonium heptamolybdate from Merck Specialities (India) Pvt. Ltd.; ethylenediamine tetra acetic acid (EDTA) from SD Fine-Chem Ltd; riboflavin from HiMedia Lab. Ltd. (India). All other reagents and solvents were of analytical grade. Raw leaves of Artocarpus heterophyllus Lam. [Moraceae], Haldina cordifolia (Roxb.) Ridsdale [Rubiaceae], Magnolia champaca (L.) Baill. ex Pierre [Magnoliaceae], Mimusops elengi L. (Sapotaceae) and Syzygium cumini (L.) Skeels [Myrtaceae] were collected from Kolkata, India between the month of April 2011 and February 2012 (Voucher no. SB/332/37-38, SB/332/40-41 and SB/332/43 available in the Dept. of Botany, University of Calcutta) and identified botanically. Properly washed and sun dried powdered leaves (15 g) were extracted (in Soxhlet) with (200 - 300) ml methanol under reflux for continuous 5 h.14 The extract was filtered and concentrated under reduced pressure in a rotary evaporator to obtain crude semi-solid mass. It was then stored at -20oC till used for experiments. DPPH radical scavenging activities of different extracts were measured following the method of Braca et al.7 Different concentrations of methanol extract (0.1 ml) of leaf were added to methanolic solution (0.004%) of DPPH (3 ml). After 30 min, absorbance was read at 517 nm. The activity as percent inhibition was measured as [ACONTROL– ASAMPLE / ACONTROL] ×100. The total antioxidant activity was evaluated by the modified method of Preito et al.10 An aliquot of 0.3 ml of solution of sample was combined with 3 ml of reagent (0.6 M sulphuric acid, 28 mM phosphate buffer and 4 mM ammonium molybdate). The tubes were capped and incubated in a water bath at 95oC for 90 min. After the mixture was cooled, the absorption of the solution was measured at 695 nm against blank using UV- Spectrophotometer. Total antioxidant capacity was measured from the regression equation prepared from the concentration versus optical density of ascorbic acid and expressed as Ascorbic Acid (µg) Equivalent (AAE) per mg of extract (µg AAE mg-1 extract). The amount of total phenol content in extracts was determined by Folin-Ciocalteu reagent in alkaline medium following the method of Sadasivam and Manickam.11 Sample solution (3 ml) was introduced into test tube containing 0.5 ml Folin-Ciocalteu reagent. After 3 min, 2 ml of Na2CO3 (20%) was added and mixed thoroughly. The tubes were placed in boiling water bath for 1 min. After cooling the developed blue colour was recorded at 650 nm against a reagent blank. Total phenol content was expressed as standard Gallic Acid (µg) Equivalent (GAE) per mg extract (µg GAE mg-1 extract). Total phenol content was calculated using the regression equation prepared from a range of increasing concentrations of gallic acid and their respective optical densities. Total flavonoid content was determined following the procedure of Kim et al.12 An aliquot of 0.1 ml of crude extract (dissolved in methanol), 0.4 ml water, 0.03 ml NaNO2 (5%) were mixed and after 5 mins 0.03 ml AlCl3 (10%) was added and left for 1 min of incubation at room temperature. Next, 0.2 ml NaOH (1M), 0.24 ml distilled water was added. All samples were measured in triplicate and compared against a blank at 510 nm. Total flavonoid content was calculated using the equation obtained from the graph of catechin concentrations versus its respective optical densities. Total flavonoid content was expressed as Catechin (µg) Equivalents (CE) per mg of extract (µg CE mg-1 extract). GC-MS analysis was carried out following the modified method of Kind et al.13 as reported previously,14 with Agilent Technology 7890A GC System equipped with 5975C Inert MS on electron impact ionization (EI) mode operated at 70eV. The column used was Agilent J and W (USA) HP-5 (10 m × 0.25 mm × 0.25 µm). The injection temperature was 250 oC and performed at 10:1 split ratio. The GC oven was kept at 60oC for 1 min to 325oC using a linear rise of 10 oC / min having 10 min hold before cooling down resulting in a total 37.5 min run time. Helium was used as the carrier gas at a constant flow rate of 0.723 ml min-1 (carrier linear velocity 31.141 cm sec-1). The MS scan parameters include 230oC ion source temperature, mass spectral range of 30-500 mz-1 and transfer line temperature was set to 290oC. Materials were prepared as reported earlier.14 Crude extract added with 20 µl internal standard (adonitol, 0.2mg ml-1distilled water) was distributed to 4 eppendorf tubes each containing 50 µl of solution. After evaporation to dryness, each sample was derivatized after methoxymation using methoxamine hydrochloride at 30oC for 90 min followed by trimethylsilyl derivatization for 30 min at 37oC using MSTFA. Prior to injection to GC machine 2µl of FAME (Fatty Acid Methyl Ester) [a mixture of internal Retention Index (RI) markers was prepared using fatty acid methyl esters of C8, C10, C12, C14, C16, C18, C20, C22, C24 and C26 linear chain length] was added. The sample was injected into GC-MS immediately after derivatization. The peaks were identified using Automated Mass spectral Deconvolution and Identification System (AMDIS). Interpretation of the metabolites was carried out by comparing the fragmentation patterns of the mass spectra, retention times (Rt) and retention indices (RI) with entries of mass spectra, Rt and RI in Agilent Fiehn Library [Agilent Fiehn GC/MS Metabolomics RTL Library (2008) (Agilent Technologies Inc., Wilmington, USA)]. Many of the metabolites were also further identified comparing the above-mentioned parameters with those of authentic samples. For all the metabolites, relative response ratio was calculated after normalizing the peak area of the compound by extract dry weight and peak area of internal standard. Some of the identified metabolites, mainly phenolics available in the laboratory were quantitated. Standard sample of each metabolite was used for preparing calibration curve. Preparation for GC was same as mentioned earlier. Calibration curves were prepared plotting concentration (ng) against peak area. Results of triplicate experiments were analysed using Microsoft Excel 2007 and presented as mean ± SD. Correlations and regressions were carried using Excel programme. Statistical significance using post-hoc analyses were also performed. Yield of methanolic extracts of the leaves are listed in Table 1. 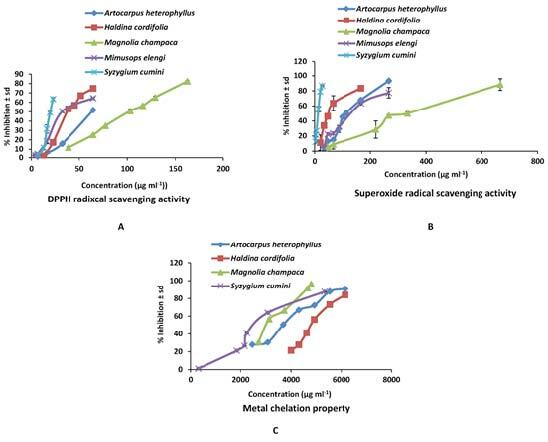 Methanolic extracts of the five different plants A. heterophyllus, H. cordifolia, M. champaca, M. elengi and S. cumini were studied to analyze their antioxidant potential in four different systems of assays e.g. DPPH radical scavenging assay, superoxide radical scavenging assay, metal chelation assay, total antioxidant capacity. Extraction yield, total phenol content and total flavonoid content in different leaf extracts. All the five extracts scavenged DPPH radical in a dose dependent manner (r = > 0.9) (Figure 1). Among them S. cumini showed highest activity (IC50 = 20.18 ± 0.41 µg ml-1) and M. champaca showed lowest activity (IC50 = 105.54 ± 1.34 µg ml-1) against DPPH free radical. The DPPH radical scavenging activities of the other materials were in the order H. Cordifolia > M. elengi > A. heterophyllus. Heat map for activity comparison and graphical representation of the activities based on IC50 values against DPPH radicals are shown in Figure 2 and Figure 3 respectively. Post-hoc tests were performed to understand the significant differences in activities in different extracts (Table 2). Dose dependent graph; A. DPPH radical scavenging activity B. Superoxide radical scavenging activity C. Metal chelation property. Heat map showing comparative account of activities in leaf extracts. Comparison of IC50 values of the plant extracts for antioxidant activities A. DPPH radical scavenging activity B. superoxide radical scavenging activity C. Metal chelating activity D. Total antioxidant capacity in different systems of assay. Post-hoc analysis to show differences in activity. The leaf extracts considered for the study scavenged superoxide radical in dose dependent manner (r = > 0.9) (Figure 1). The superoxide radical scavenging activities of different extracts were compared based on their IC50 values (Figures 2 and 3). S. cumini leaf extract was found to be the most powerful as it showed lowest IC50 value (13.27 ± 0.14 µg ml-1). Other leaf extracts showed activities in the order H. Cordifolia > M. elengi > A. heteroplyllus > M. champaca. Post-hoc tests are presented in Table 2. The result demonstrated that formation of ferrozine-Fe2+ complex is inhibited in the presence of leaf extracts in dose dependent manner (Figure 1). The highest activity (Figures 1 and 2) was noticed in S. cumini extract having lowest IC50 value (3.07 ± 0.01 mg ml-1) and H. cordifolia showing lowest activity with highest IC50 value (5.02 ± 0.02 mg ml-1). Activities of the other extracts were as follows: M. champaca (IC50 value = 3.25 ± 0.03 mg ml-1); A. heterophyllus (IC50 value = 3.91 ± 0.03 mg ml-1) (Figures 2 and 3). M. elengi showed no activity within the range of (0-7) mg ml-1 concentration. Post-hoc test analysis (Table 2) shows the difference in activities. The total antioxidant capacity expressed as ascorbic acid equivalent (µg AAE per mg of extract) was determined. S. cumini was found to have highest total antioxidant capacity i.e. 1 mg extract had antioxidant capacity equivalent to 0.95 ± 0.16 μg ascorbic acid. The comparison of activities of the five extracts is presented in Figures 2,3. Total phenol content was found to be highest in H. cordifolia followed by S. cumini (1.26 ± 0.62 and 1.06 ± 0.35 μg GAE mg-1 extract respectively). The rest are in decreasing order of content M. elengi > M. champaca > A. heterophyllus. 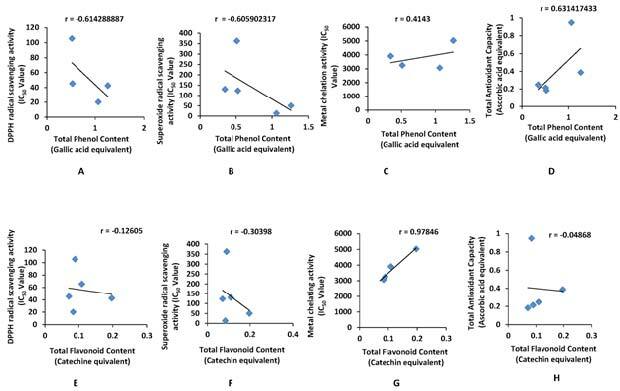 Total flavonoid content was highest in H. Cordifolia followed by A. Heterophyllus (0.2 ± 0.07 and 0.11 ± 0.02μg CE mg-1 extract respectively). The rest are in decreasing order of M. champaca > s. cumini > M. elengi (Table 1). Antioxidant activity of an extract is due to presence of antioxidant metabolites in it. To know the chemical composition of the extracts each sample was analysed by GC-MS based metabolomics approach. Relative Response Ration per g weight of extract of each metabolite is presented in Table 3 for semi-quantitative comparison. GC-MS analysis revealed the presence of a total 17 different metabolites in H. cordifolia, 23 metabolites in A.heterophyllus, 26 metabolites in M. champaca, 36 in M. elengi and 34 in S. cumini. The result showed that all samples contained sugar and derivatives, amino acids (except H. Cordifolia), fatty acids, phenols and flavonoids, organic and inorganic acids. Different sugar and derivatives detected were allo-inositol, cellobiose, galactinol, glycerol, glycerol-1-phosphate, lactitol, lactose, D-mannitol, D-sorbitol, sucrose, D-threitol, D-(+) trehalose and xylitol. Seven different amino acids were identified. Fatty acids (8 different types) were sparingly dispersed within these species. Prevalence of phenols and flavonoids were noticed in the extracts. The extracts contained 7 organic acids and 1 inorganic acid. Some of the metabolites were also quantified using GC-MS from standard curves of authentic samples (Figure 4). Quantification of some phenolic metabolites detected through GC-MS. List of metabolites identified from different leaf extracts. Antioxidant activities of all these plant extracts were correlated to their total phenol and total flavonoid contents (Figure 5). Lower IC50 value indicates high activity. So IC50 value is inversely proportional to the active constituents. Good inverse correlations were achieved for total phenol content and IC50 values for DPPH radical scavenging activity and superoxide scavenging activity. Good correlation also existed between total antioxidant capacity and total phenol content. However, correlation between metal chelation activity and total phenol content was poor. Lower correlations for total flavonoid content to DPPH radical scavenging activity and superoxide scavenging activity were obtained. Poor correlation was found for total flavonoid content and metal chelating activity. Correlation between antioxidant activity A. DPPH radical B. Superoxide radical C. Metal chelation D. Total antioxidant capacity and total phenol content; Correlation between antioxidant activity E. DPPH radical F. Superoxide radical G. Metal chelation H. Total antioxidant capacity and total flavonoid content. Antioxidant activities were also correlated to all the metabolites identified (Table 4). There were significant correlations between some of the identified metabolites and activities. The compounds mainly responsible for DPPH radical scavenging activity were found to be mannitol, trehalose, glycerol-1-phosphate, galactinol, alanine, L-glutamic acid, L-pyroglutamic acid, phytol, tartaric acid, protocatechuic acid, gallic acid, epicatechin, catechin. Compounds with good correlation to superoxide radical scavenging activity were mannitol, phytol, tartaric acid, L-glutamic acid, protocatechuic acid, epicatechin, catechin. Total antioxidant capacity had shown good correlation with total phenol content, as well as with the compounds alanine, L-glutamic acid, L-pyroglutamic acid, mannitol, glycerol-1-phosphate, galactinol, protocatechuic acid, catechin, epicatechin, tartaric acid, myristic acid. List of metabolites correlated with activities. There is a growing demand and increasing interest on natural products with no adverse effect on human beings and environment.15 Antioxidants can prevent diseases through their radical scavenging potential.16 Plant based antioxidants are preferred over synthetic antioxidants.17 In vitro assays for measuring radical scavenging and other antioxidant properties are followed frequently. DPPH radical scavenging activity is one of the commonly practised methods of assay. Antioxidant potential of an extract or a metabolite depends on the ability to donate electrons or hydrogen atoms to neutralise free DPPH radicals.18 The colour of the reaction mixture changes from purple to yellow. As a result, the absorbance at wavelength 517 nm decreases. Superoxide radical, although a weak oxidant, is considered a major biological source of reactive oxygen species.19 This free radical generates most dangerous hydroxyl radical and singlet oxygen. Iron is implicated in many oxidative stress related pathways and conditions and is the primary generator of hydroxyl radicals and hydro peroxide decomposition reaction via Fenton chemistry that damages DNA and other bio molecules.20 In the present study, the DPPH radical scavenging activities, superoxide radical scavenging activities and the metal chelating properties of the extracts were studied. In addition, the total antioxidant activity equivalent to vitamin C was also measured. All the extracts showed radical scavenging activities, although, the activities as determined by the IC50 values were different. The antioxidant properties of plants or plant extracts are due to presence of important ROS scavenging metabolites. So, identification of such metabolites is important. Breakthrough in methods of phytochemical analysis 21 has made it possible to identify many metabolites in a shortest possible time. GC-MS based analysis using Fiehn library has enabled us to identify many phytochemicals belonging to sugars, polyols, organic acids, amino acids, fatty acids, terpenoids, simple phenols and polyphenols including flavonoids from the extracts of the five leaf samples. Correlation analysis of identified metabolites and activity profile helped to detect the presence of important chemicals contributing towards antioxidant activities of the studied plant extracts. They were not only limited to phenols but also included sugars, polyols, fatty acids, terpenoids, amino acids. Literature survey indicated that many of such metabolites are antioxidants. Mannitol protected retinal pigment of epithelium cells against the H2O2 induced oxidative stress by increasing the level of catalase.22 Trehalose scavenged reactive oxygen species.23 Bioavailability of polyphenols can be enhanced by the presence of tartaric acid.24 Myristic acid is known to prevent oxidation.25 Phytol, a diterpene product of chlorophyll metabolism in plants, is also a potent antioxidant. Phytol plays effective role in the removal of hydroxyl ions, reduced nitrite production, and prevented lipid peroxidation by inhibiting formation of thiobarbituric acid reactive species.26 Phenols and flavonoids are very effective scavenger of free radicals and chelator of metal ions. This group of phytochemicals is one of the most extensively studied well-known groups of compounds having antioxidant activities 27 Gallic acid scavenged DPPH radicals.27 Gallic acid, and the flavonoids catechin and epicatechin showed peroxyl radical scavenging activities, catechin having highest activity.28 Antioxidant activity of the flavonoid myricetin is due to its reactive oxygen species scavenging property and iron chelation property. 29 Highest chelating activity in S. cumini with maximum number of flavonoids supports this view. S. cumini also contained all the phenols correlated with different activities. So, the leaf extract of this plant showed high activities in all the systems of assays. Further research is required to identify important antioxidant metabolites from this plant using other methods of analysis. The studied leaves are mostly wasted as leafy residues from plants except S. cumini which is reported as antidiabetic.30 M. elengi is also known to have anti-hyperglycaemic and anti-cholinergic activities.14 So these plant parts may be used as renewable sources of antioxidants. Due to immense importance of antioxidants, different plant sources are screened by in-vitro biological assays for antioxidant activity. Results depict that among the 5 experimental plants extracts S. cumini showed highest antioxidant potential. Most of the metabolites found correlated with activities have been reported as pronounced antioxidants. Therefore, leaf extracts may be considered as sources of potential phytochemicals having antioxidant activities. Santos CC de MP, Salvadori MS, Mota VG, Costa LM, De Almeida AAC, De Oliveira GAL , authors. et al. Antinociceptive and antioxidant activities of phytol in vivo and in vitro models. Neurosci. 2013. Article ID 949452. Extracts of leaves from five plants e.g. Artocarpus heterophyllus, Haldina cordifolia, Magnolia champaca, Mimusops elengi and Syzygium cumini showed antioxidant properties by four different systems of assays. All the extracts scavenged DPPH radical, superoxide radical, and chelated metal in dose dependent manner. S. cumini showed strongest antioxidant activities in all systems of assays. A large number of important phenols and other metabolites were identified by GC-MS analysis. Important phenolic antioxidant compounds identified were catechin, epicatechin, protocatechuic acid (from S. cumini), gallic acid, myricetin (from S. cumini, M. elengi), arbutin, 4-hydroxycinnamic acid (from M. elengi). Thus the above mentioned leaf biomass may be used as an alternative source of these important antioxidant phytochemicals. Ms. Sainiara Begum, Research Fellow, Department of Botany, University of Calcutta, Kolkata, India. Dr. Archana Banerjee, Retired Associate Professor, Department of Botany, Surendranath College, Kolkata, India. Dr. Bratati De, Professor, Department of Botany, University of Calcutta, Kolkata, India. Cite this article: Begum S, Banerjee A, De B. Analysis of Antioxidant Activities, Phenolic and Other Metabolites of Some Biomass Waste (Leaves) of India. Free Radicals and Antioxidants. 2018;8(2):102-10. ‹ Antioxidant Capacity of Some Selected Medicinal Plants in East Nusa Tenggara, Indonesia: The Potential of <italic>Sterculia quadrifida</italic> R.Br.